If you're not looking to carry half your kid's football team to practice and have a desire for an SUV that places safety and comfort front and center, the XC90 makes an excellent choice for the family transport. I was always a Volvo fan because of its safety. I bought my car 10 years used and I am impressed in how it is still in a good shape. All the functions still works, it has a lot of space, the seats are super comfortable, and considering how old it is, the mileage is not bad at all (20 mph average). My car is V6 all wheel drive and it is super stable. It responds fast when you need to speed up, which is great on highways. My favorite thing about this car is the blind spot sensor, which saves you from having to look back on every time you will change lanes. Another feature I really like is the sensor for the tire pressure, as a woman (true to be told), I don't always worry on verifying the tires and oil, and having features that reminds you about those is really useful. My car came with plastic rubber cover for the trunk and also with a metal gate which is perfect for me to carry my dogs and not having them jumping to the back seat or damaging any of the carpet in the trunk. I am really satisfied with my XC90 and I plan to exchange it for a newer one soon. 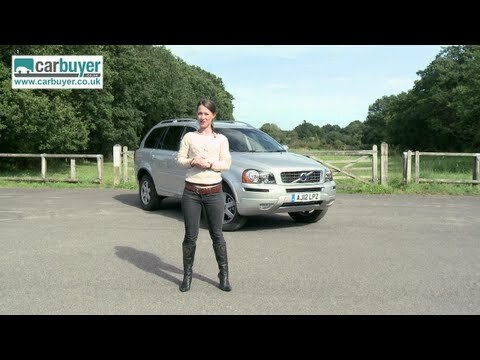 10 being the highest, I would give 2008 Volvo xc90- 8 out of 10 stars. I really enjoy my Volvo 2008 xc90. Aside from the great lines on the vehicle the interior is beautiful. My vehicle has brown and cream leather with a cream fabric. The fabric is very durable and somewhat easy to keep clean. The vehicle also has a great cargo capacity and many neat and useful. Storage spaces include a nifty "grocery bag holder" in the rear cargo space. It also has unique center seating area for children in a car seat where the center rear console can be removed to move the child forward for ease. The vehicle however has had to have all of its motor mounts replaced. Some more then once which depending on which mount it is can be very costly. I would consider purchasing this vehicle (in a newer year) again. It is a very comfortable car. Being 5’4 “ I do have to sit quite close to steering wheel which makes it hard to get out and in of vehicle. Just doesn't seem door opens wide enough and visor hits my head when down. A telescoping wheel would help and automatic seat. I do love the cloth and leather interior. Makes it so you don't slide around as you go thru a corner as you would just leather seating. The rear seat has a child feature where you can slide the center back seat forward and remove the center console for easy access to a child in a car seat. Also, the rear cargo area has a nifty “grocery bag” holder and lots of convenient hidden storage. ON CERTAIN SPORT UTILITY VEHICLES, UNDER CERTAIN CONDITIONS, THE CLIMATE CONTROL MODULE (CCM) MAY RECEIVE A 'SHUT-DOWN SIGNAL' FROM THE ENGINE CONTROL MODULE (ECM) AFTER IGNITION KEY INSERTION. IF THIS CONDITION OCCURS, THE CLIMATE CONTROL FUNCTIONS WILL NOT BE AVAILABLE (INCLUDING THE DEFROSTER) DURING THAT DRIVING CYCLE. INOPERATIVE DEFROSTERS UNDER INCLEMENT WEATHER CONDITIONS COULD CAUSE IMPAIRED VISIBILITY WHICH HAS THE POTENTIAL TO RESULT IN PERSONAL INJURY AND/OR VEHICLE AND PROPERTY DAMAGE. THE ECM SOFTWARE WILL BE UPGRADED. THE MANUFACTURER HAS NOT YET PROVIDED AN OWNER NOTIFICATION SCHEDULE FOR THIS CAMPAIGN. OWNERS MAY CONTACT VOLVO AT 1-800-458-1552.